Sunday: Dad brought me O-Ke-Doke cheese popcorn, Jay's potato chips, and lots of tomatoes grown in good Illinois black dirt. They also treated us to dinner that evening. Monday we had a cookout with my Dad for Labor Day. We had hamburgers, hot dogs, baked beans, shoepeg salsa, and chips. The food was delicious and the company even better. It has been over a year since I saw my Dad, so it was good to catch up with him. Wednesday, Thursday, and Friday I worked. I took my lunch on all of those days using up some leftovers from dinner I had made earlier in the week. I also took an orange each day that I had picked up on the reduced produce bin from Food City. On Monday I cashed in some Swagbucks to earn a $10 gift card for Walmart, and I already have enough Swagbucks to earn another $10 card for this month. I'm going to save them up this month to see how many I can get. 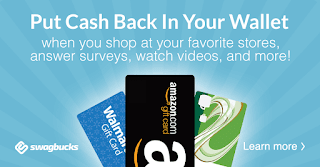 It would be great if the things I need monthly from Walmart can be obtained free by using Swagbucks. My daughter gave both of us a haircut this week, so free to us. I love saving money this way as I usually save around $20 having our hair cut at home versus getting our haircut at Great Clips. My daughter made a run to Aldi on Friday to pick up fresh produce while I was working. She picked up carrots, watermelon, cauliflower, potatoes, bananas, lemons, and naval oranges. We shop from their "Produce Picks of the Week" section, which saves us money. The total amount spent was: $20.00. On Saturday I woke up early and started cleaning and making stuff for the upcoming week in the kitchen. I had some bananas that needed using up, so I made green smoothies for breakfast also using up some fresh spinach. The rest of the bananas went into the freezer. I cut up all the cauliflower, watermelon, and cantaloupes for the upcoming week. I had some corn on the cob, which I shucked and cooked. I also made a batch of vegetable egg rolls. Prep time on the weekend saves me time during the week which helps to ensure that I takes meals from home for our lunches and that saves me money. We stayed home this weekend, not venturing out and not spending any money or using up the gas in our cars. Today I was able to cash in some reward points for a free bag of cat food from Purina My Perks reward program. So happy you got to visit with your dad! Memories you have for a lifetime. How nice of him to bring you all the goodies. Sounds like a bunch of great finds at Aldi. Love fresh fruits and veggies. Love hearing about your week! Always good tips and motivation. :) Hope you have a good week coming up. I haven't got to comment in such a long time. Missed your blog. So inspired by this weeks food prep. My 50 almost 60 year old central air unit has decided it is time to retire. DH & I do not need a fancy air conditioning system. We do need one because we are in the Ozarks with all the humidity. DH, doggie & me all have asthma. We bought a really nice LT Air Conditioner for under $100 on Ebay brand new. The original price was over $200. We are so happy with it. That was my frugal excitement for the week. Trying to get back to normalcy after a crazy but nice Summer. I hope you have a great week for back to school and get lots of hours. Thank you so much, Aiyana. Your new air conditioner sounds great, and what a nice bargain you got! Way to go! We would be miserable without ac here in the summer. I can only imagine how hot it gets in the Ozarks. Glad you were able to find one inexpensively! Your week sounds wonderful, Belinda. Nice that you had some time with your dad. I think you're very wise in prepping so much healthy foods, on the weekend. I'm sure that it not only saves money, but is also healthier than a lot of fast choices at work. Good job! Have a great week, Belinda! How wonderful! I'm glad you got to visit with your dad. I love Aldo's picks of the week. I try to take advantage of them whenever I can. I didn't do a lot of food prep over the weekend, but I did do two cook once and eat twice meals and we did a clean out fridge day on Sunday. Happy for your family time, Belinda. Somehow, you fit in everything. Your shoepeg salsa is a beautiful side. DIY haircuts save us between $700 to $800 annually. Dermatologist allows only Dove unscented for hair shampoo. DIY usually saves us $$$. Our household prepares ahead with meals, too, because it is frugal. Doing many frugal tricks of the trade keeps your head above water. Yes, DIY does help to keep your head above water, Anna. DIY Haircuts at home and preparing meals ahead are all good frugal tips to live by. I know doing these things has saved me a lot of money over the years.